6ix9ine is facing serious jail time following his arrest on racketeering and firearms charges. According to a 17-page federal indictment, obtained by TMZ, Tekashi and his Nine Trey Gangsta Bloods were charged with six counts, including discharging a firearm while committing a crime, which carries a possible life sentence and a mandatory minimum of 25 years in prison. His ex-manager, Kifano “Shotti” Jordan, is facing the same six counts. On April 3, Tekashi, Jordan, Butler, and Walter robbed gang rivals at gunpoint, according to the indictment charges. A shooting occurred April 21 inside Brooklyn’s Barclays Center and Tekashi’s associate Fuguan “Fu Banga” Lovick is named as the shooter. The indictment lists eight counts for an array of crimes to maintain the gang’s “power, territory, and profits,” reports the New York Daily News. Prosecutors claim that members of Nine Trey sold heroin, fentanyl, MDMA, and weed in Manhattan, Brooklyn, and the Bronx. 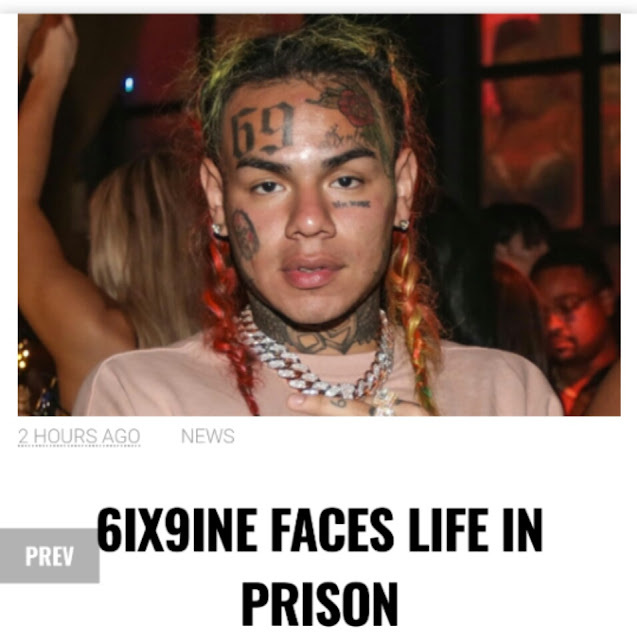 Tekashi appeared in court on Monday (Nov. 19) with his hands and feet shackled. His family, including his mother, were present during the arraignment. He was denied bail and will remain in custody pending trial. Last week, Tekashi fired his entire team including his manager, publicist, and booking agent, and canceled his upcoming U.S. tour. During an interview with “The Breakfast Club,” he revealed his two fears. “Only two things I’m scared of in life, God first and the FBI,” he said.